Jamie Heaslip and Cian Healy will have surely impressed watching Lions coaches Rowntree and Jenkins. Jonathan Sexton celebrates his try. BIARRITZ LOCK ERIK LUND towered above the Franco-Hibernian press corp and took about two seconds to decide who would be favourites for the Amlin Challenge Cup Final. “Leinster, at home, you can’t look past them,” Lund told TheScore.ie. Considering that he has played, and lost, to Stade Francais [the other finalists] this season, Lund’s proclamation should hold some weight. The Blues savaged Biarritz in the second-half of their semi-final win, with Brian O’Driscoll and Isa Nacewa running in tries, but the real damage was done in 180 crazy seconds before the break. Dimitri Yachvili slotted over a 38th minute penalty to put his side within a point of Leinster, who had got off to a superb start through try-scoring Jamie Heaslip. The reigning Amlin champions would have been happy to go into the break well in touch but Leinster were not finished. Rob Kearney bust a tackle on the French 22 and wisely opted to offload to Jonathan Sexton. The outhalf converted his score and may have fancied his chances at a penalty attempt from the halfway line when Biarritz erred from the restart. A quick-tap was taken instead and 30 seconds later, Heaslip, described by teammate Cian Healy post-match as having a “savage” game, scored his second. 44-16 at the end and injury concerns over Sexton, who wanted to play on but was subbed after 49 minutes, and Fergus McFadden allayed. The Kiwi described the game’s opening try, a tremendous attack off the back of a deliberately overthrown lineout to Devin Toner that went Nacewa-Heaslip-try, as ‘top drawer’. A bonus point win over a floundering Ospreys side, at the RDS next Friday, will set Leinster up for a home Pro12 semi-final, with Glasgow Warriors the likely opponents. With Isaac Boss deftly running the show for Leinster, the only question remaining – after Schmidt confirmed there was no updates on the Ireland head coach position – was the blow the scrumhalf took to the head in the second half. Schmidt found time to praise the Leinster A side that went down to Limerick and won ‘an absolute ding-donger’ against Munster on Friday night. Before he left the press room he stopped at the television and watched five minutes of his former side, Clermont, as they fell behind to an early Munster penalty in the semi-final of a competition. Leinster are on the support stage in European rugby this Spring but they are determined to take their final bow as winners of a league and cup double. 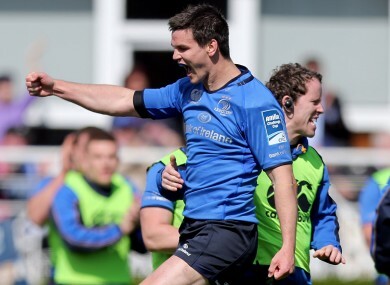 Email “Reaction: Double dream alive for Leinster after 5-try rout”. Feedback on “Reaction: Double dream alive for Leinster after 5-try rout”.